Today was evolution day at the Faraday summer school (see posts below), with a number of fascinating talks on the theory of evolution. First up was Professor Stephen Freeland of the University of Maryland. 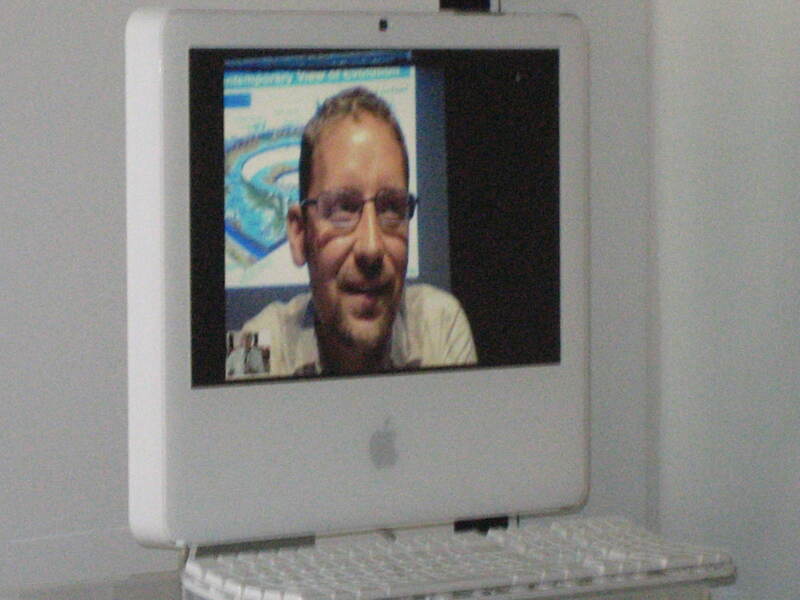 An interesting aspect of Stephen’s talk was that it was delivered in realtime (by Skype) from Hawaii! 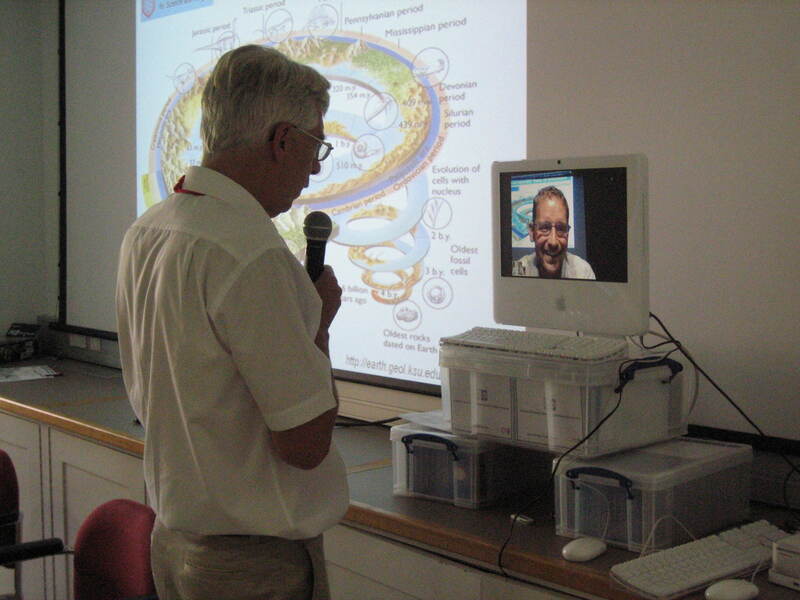 With his slides projected on the conference screen and his voice and image on a nearby computer, one quickly forgot he was not actually in the room. Stephen’s first talk was a super overview of the modern status of the theory of evolution by natural selection, explaining how advances in microbiology and genetics have strengthened and deepened the theory. One interesting aspect of this talk was Stephen’s belief in the fallacy of human supremacy: he sees humans as far from the top of the chain of life, as often depicted. Indeed, he showed that a great deal of the common portrayal of man at the pinnacle of the evolutionary tree really arises from pre-Darwinian theory! Stephen also gave a talk on astrobiology, the study of life on other planets. Much of astrobiology is concerned with the study of the emergence of life in the earliest years of earth, but there was a fascinating overview of the factors need for life elsewhere. I particularly enjoyed his discussion of attempts to quantify the Drake equation, an equation that attempts to describe the probability of there being intelligent life on other planets (more on this later). Next up was a fascinating talk by Simon Conway Morris on ‘Evolution and the Inevitability of Man’. This was a superb overview of the theory of convergence in evolution, a theory Simon has pioneered. Essentially, it concerns the fact that many complex organs such as the camera eye have evolved not once, but several times. Simon went on to explain why he evolutionary convergence may render the emergence of intelligent life not just likely but inevitable, and sees the evolution of intelligent life as an ultimate and inevitable result of the process, in marked contrast with the previous speaker. This was followed by a superb talk by Keith Fox, Professor of Biochemistry at Southampton University on ‘Creation and Evolution’. Essentially, Professor Fox gave a detailed exposure of scientific flaws in young earth creationism, and in intelligent design. He finished with a description of theistic evolution. In a way, this talk was the most archetypal of the week – a careful rebuttal of the literal positions of fundamentalists by a highly educated scientist and theologian. What kind of language is used in the text? There followed a detailed discussion of the interpretation of the Book of Genesis, with Dr Lucas concluding that a figurative rather than literal interpretation is clearly called for. Again, this was a strong attack on fundamentalism by a renowned theologian, absolutely fascinating. 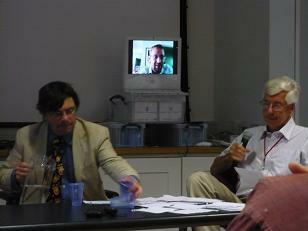 The day finished with a planary question-and-answer session chaired by Dr Denis Alexander, with Stephen participating by Skype link. Again, I was astonished how well it worked. Thanks for such an inspirational blog – it cannot be a bad thing to have so many people with passion for this broad topic able to share thoughts and insights to all those who care to find or stumble into the information. I wonder if ultimately this information revolution will provide a key to undermine the superficial prevalence of extremists (on all sides) who’ve tended to dominate mainstream media coverage? Thank you for your kind words and succinct coverage of my own presentations. I am glad the technology worked out from your point of view, though I must apologize that the the unusual hours (my local time) and the absence of adrenaline that comes from standing in front of a live group probably dulled my edge, in terms of thinking on my feet, this time around. The one content-based comment I’d make is to distinguish the idea that we are not necessarily the pinnacle of evolution from the idea that we are not special, unique or important. I wanted to emphasize the idea that the science of evolution (which simply studies “genetic change over time”) has yet to find a reliable, objective measurement system for saying anything about what constitutes more or less “highly evolved”. On the one hand all of our planet’s species are unique, special and equally “highly evolved” to have made it through ~4 billion yrs of evolution. On the other, our philosophy, theology, literature, art and so forth can all provide an identity for our species that places us apart from the rest of the natural world. Thus my intention was simply that to regard evolution, per se, as granting us some special status is (in my view) beyond the boundaries of what evolution can claim. I greatly enjoyed the discussion in which it was mentioned that one view of natural theology sees all of creation is in relationship with God. To see ourselves as unique seems to me a far safer bet than to see ourselves as obviously superior. Many thanks Stephen! I kinda dashed that off, so apologies for the sloppiness and comments most welcome. Re “see ourselves as unique rather than superior”, that’s put very well. In fact, I’d like to add your comment above to the blog post as an update, if I may. 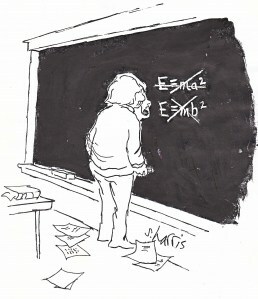 Its much clearer and I like students to see their prof don’t always get it right either!